The inventory of Edward Cuthbert provides interesting information about the household possessions and living arrangements of an eighteenth century blacksmith. Edward Cuthbert (als. Cutboard) settled in Appleby after the Restoration to join the handful of blacksmiths already established in the parish, including the Wathews who were prominent horse traders. The blacksmiths may have all worked together in the same shop at one time. Edward and his wife Sarah recorded the baptisms of several of their children in the parish register. Somewhat sadly three of the boys named after their father all died either in infancy or as young children. 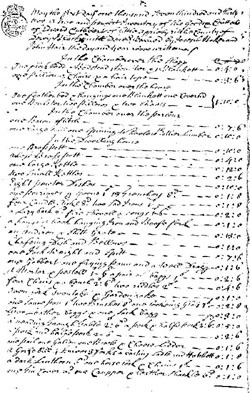 Edward's inventory which was drawn up in 1732, by which time he was probably a widower and his children had left home, suggests that they once occupied a comfortable two-storey house in Little Appleby with an attached workshop, well equipped with all the tools for repairing farm carts, ploughs and other implements, for shoeing horses and for general ironmongery. I am not sure whether the house or the shop is still standing, however it might be possible to locate the site through census records.